The hosts dubbed the meeting a "summit of equals"
As the Portuguese hosts hailed a "new chapter" in relations, Senegal's president railed against new EU-African trade deals proposed by the EU. And Zimbabwe's President Robert Mugabe reportedly accused Europe of arrogance in criticising his human rights record. The BBC's Mark Doyle, in Lisbon, says the joint declaration is hugely ambitious in scope, and that clear differences remain on several issues. Angry words flew over trade deals - known as Economic Partnership Agreements - proposed to replace existing agreements due to expire at the end of the year. "We are not talking any more about EPAs, we've rejected them," said President Abdoulaye Wade of Senegal. 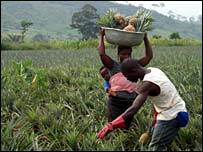 The deals - to replace historical agreements which gave former European colonies preferential trade terms - demand that African countries open their markets to European goods in order to keep tariff-free EU access for their own exports. But President Wade said that "Europe is close to losing the battle of competition in Africa". The point was evidenced by tensions over the presence of Mr Mugabe, widely criticised for human rights abuses and economic mismanagement in Zimbabwe. Although he is banned from the EU, African leaders demanded he be invited to attend. UK Prime Minister Gordon Brown boycotted the meeting in protest. On Sunday Mr Mugabe was reported to have lambasted four EU countries, Sweden, Denmark, Germany and the Netherlands, for "arrogance" in their criticisms, according to a copy of a speech at a closed meeting obtained by French news agency AFP. His comments came in response to German Chancellor Angela Merkel's earlier assertion that his policies had "damaged Africa". "It is important that people keep in mind that Africans fought for human rights from oppressive rule," said Mr Mugabe, who is regarded by many African leaders as the heroic liberator of Zimbabwe. 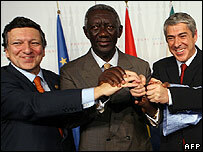 The meeting was the first EU-African summit for seven years. Previous attempts had collapsed over the question of Mr Mugabe's attendance. Portuguese PM Jose Socrates, who earlier lauded the gathering as a "summit of equals", said it was an achievement in itself that the meeting had taken place.